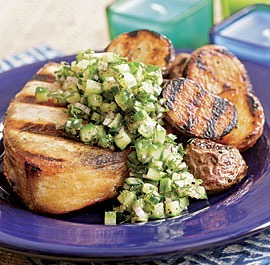 Put the swordfish steaks in a shallow dish. Mix the lime juice, olive oil, garlic salt and pepper and spoon over the steaks. Turn to coat evenly and leave to marinate for at least half an hour. Preheat the grill. Grill the swordfish close to the heat for about 2 minutes on each side. Don’t overcook or it will be just cooked through and no more. For the salsa, cut the rounds of cucumber into quarters. Place in a bowl with salt, caster sugar and vinegar. Stir and then leave for at least 1 hour. Meanwhile, quarter the slices of onion and marinate with the sugar salt and vinegar in exactly the same way as the cucumber. Shortly before serving, drain the cucumber and onions and mix with the tomatoes, coriander and chili. Adjust the seasoning. 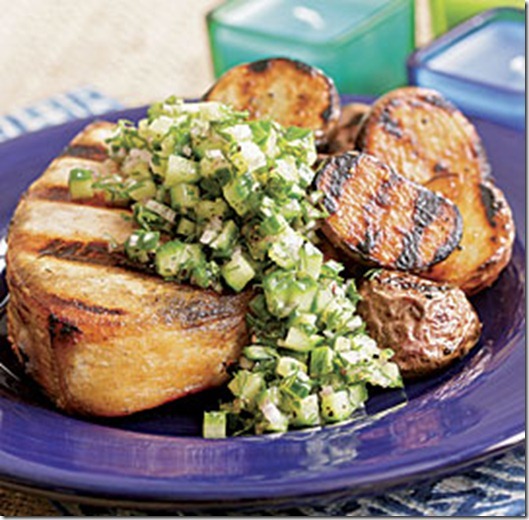 Serve swordfish steaks with salsa.